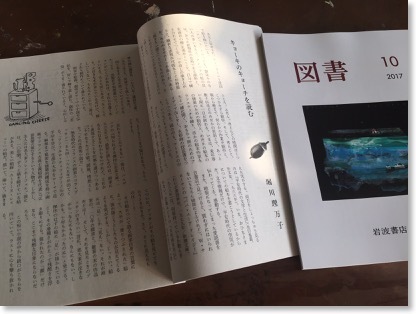 「図書」10月号に　The monthly PR magazine "Tosho"
The monthly PR magazine "Tosho" by publisher Iwanami is full of attractive articles. Osamu Tsukasa draws the cover illustration, every month. A friend who works for them asked me to write an essay and draw illustrations for it. The title is "Reading a state of insane in novels ". I rewrote it several times to finish it. I discussed three books, "The Masterpiece Unknown, by Balzac, "The Affair Of The Hell" by Ryunosuke Akutagawa, and "Making The World With Lora" by Lora Karlin, etc. in it. The friend who advised me to write it is Naomi Saruyama. Thank you Naomi, I appreciate your cooperation.